So you have debt. What are you going to do about it? Perhaps you have been hiding from your debts, hoping they will go away, but it’s a good bet that they are still there, waiting for you to deal with them and probably growing bigger. While reducing debt is never easy, there are steps you can take to make the process somewhat easier. The first step is often the hardest. The first step on the road to debt reduction involves taking a good hard look at your financial situation. Scary indeed. Apply for a copy of your credit report, and collect all your bank statements, credit card statements, bills, and details of any other outstanding debts. Once you have all that information, you need to create a budget. This should include all regular and one-off incomings and outgoings, the dates payments are due, and the amounts due. 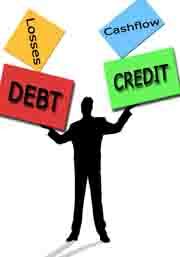 Try to rank your debts according to interest, keeping in mind any overdue payments and late fees. There are budget programs and apps that can help with this process. If you are in trouble with debt, it’s important that you stop overspending and impulse buying. Your budget should include the amount you are allowed to spend on a weekly or monthly basis on certain items. If you are cutting back, make sure you don’t overspend and get into more debt. There are dozens of ways you can become more thrifty, allowing you to save heaps of money simply by making small changes. Try to be creative when it comes to saving money, here are 7 creative people check it out and see if you can incorporate them into your life. If you have time, you may want to consider picking up some extra work to add a little more to your bottom line. Consider the tax implications of taking out a second job to make sure it is worthwhile. Some people manage to pull themselves out of debt just by creating a budget, cutting back and saving. However, that doesn’t work for everyone. While it’s still important to follow the above steps, you may also want to consider taking out a loan to consolidate your debts. You could take out a personal loan or debt consolidation loan to cover all or some of your debts. With this option, you are effectively rolling your debts into one loan. This can make it easier to keep track of your debts, with only one interest rate and one payment date, and if you have creditors on your back, this can be a good way of getting them off. Just think about how much you will pay in interest overall with the new loan, as well as the implications of spreading your debt over a longer period of time. If you have built up equity in your home, you may be able to take out a home equity loan to pay off your debts. Again, think about the implications of doing this, and how much it will cost overall. If you have credit card debt, you could transfer your balance onto a balance transfer card. If you get a good deal, you could pay no interest on your debts for up to 12 months or longer. Use this time to repay your debt – and don’t use the free credit on your old card to rack up more debt. Once you have considered and compared all your options, decide which one will work best for you. This process can be made easier using the services of a broker such as Lend Me. A broker can help you identify and evaluate your loan options, search for loans, and complete your application.